Round 3 Already! Last week’s deluge and slop had hardened nicely to make for some fast new trails through plantations sprouting spring growth – Watch out for those stingers…. Big news from the coursebuild was the mower broke; it’s terminal – con-rod or crankshaft – and I lost my penknife. Grrr. Still, it wasn’t wet and cold this week and the course was finished by race time Hooray! Course was planned to be fast and fun. Comments indicate mission:accomplished. Some good styling over jumps and rollers captured on this week’s video. 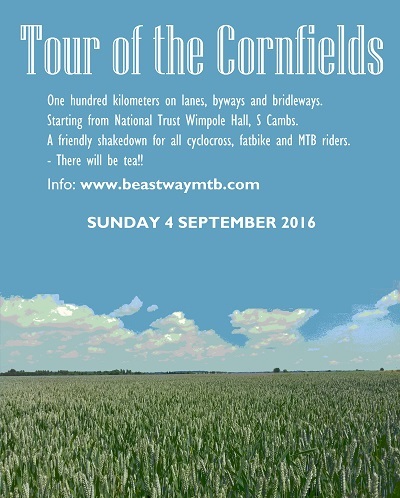 You’ll also see early info about our 100km off-road adventure on bridleways, byways and lanes of S Cambs. Sunday 4 September 2016, based at National Trust’s Wimpole Hall. You probably want to enter this well in advance as it sells out. The u12s had a nice course around the top and around hedge line into the Hoggenbreaker area. They all enjoyed their race and it was good to see the one faller quickly remounted. Round 2 of Beastway 2016 will be remembered for some difficult weather. It rained all day, right up until the start of the seniors race. Sometimes heavy but more often torrential rain was falling; an Osprey plane / helicopter was flying around and it really seemed like judgement day as your coursebuilders were out there stupidly putting up a course that had been planned according only to the forecast weather. This was the first time that the ‘ban’ on access to the lower meadow meant some major revisions, but thanks to the enlightened management of Hog Hill we were able to open up more pens around the lower road circuit. The wet conditions made many sections unrideable and others as slippy as. BUT IT WAS FUN! and it’s always the same for everyone who raced. And here’s a little video which shows the cameraderie and grit that makes Beastway special. Remember, this was only shot after the rain had stopped and doesn’t show anything like the mud elsewhere on the course (OK, I got so cold after all day in the rain that I had to get a shower and change while the race was on… ready to take the course down). Run under the earlier apocalyptic conditions, all the U12s showed commendable resolve with a 100% finish rate. They were routed along the fun bumps around the back of hedge-line for the first time and they all did well. Remember to keep an eye on our facebook group.